If you are considering graduate school after you have completed your undergraduate studies you can get a head-start by working with your academic advisor to plan a course of study that leads to both the BS in Civil Engineering and the MS in Civil and Environmental Engineering. This course of study will typically require ten semesters of study, although advanced placement or other study may reduce your time. With the approval of your academic advisor, you may take courses while an undergraduate that will count toward your MS degree as long as these courses are beyond the 379 units required for the BS in Civil Engineering degree. 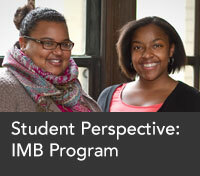 Complete the IMB Program Declaration form and submit to David Vey, Graduate Admissions and Recruiting Manager. Upon admission, you will be assigned a graduate studies advisor and you are expected to meet with your graduate advisors regularly to deveop your course of study and which graduate level courses to register for. If you have questions about the graduate program or application process, please contact David Vey, Graduate Admissions and Recruiting Manager. When Jennifer Martinez and Brittani Grant, who were undergraduate students in the Civil and Environmental Engineering Department, started to choose where they wanted to complete a graduate degree, the choice seemed pretty obvious.